and Ab42.2. (A) Serial dilutions of Aβ40, Aβ42, and Aβ38 were used to determine the crossreactivity of Ab42.2 by capture ELISA. Ab42.2 was used as capture and Ab9-HRP as detection. (B) Serial dilutions of Aβ40, Aβ42, and Aβ38 were used to determine the crossreactivity of Ab40.1 by capture ELISA. Ab9 was used as capture and Ab40.1 as detection. (C) Schematic depicting the method for capture ELISA of biotinylated mAb–Aβ complexes in plasma. 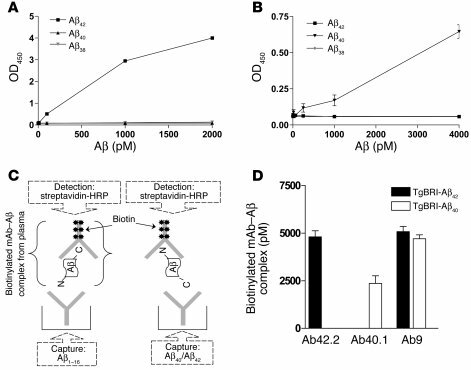 (D) Specificity of Ab42.2 and Ab40.1 in vivo. Biotinylated Ab42.2, Ab40.1, and Ab9 (500 μg) were injected i.p. into TgBRI-Aβ40 and TgBRI-Aβ42 mice (n = 3 per group). Seventy-two hours after injection, levels of biotinylated mAb–Aβ complexes in plasma were determined using capture ELISA as illustrated in C. Plasma levels of Aβ40 were ~1000 pM in TgBRI-Aβ40 mice, and plasma Aβ42 levels were ~1000 pM in TgBRI-Aβ42 mice. No Aβ42 was detected in the plasma of TgBRI-Aβ40 mice, and no Aβ40 was detected in the plasma of TgBRI-Aβ42 mice.